A bounceback stint with the Cubs made Jason Hammel, a 6’6 righty, one of the most anticipated summer trade targets, and he ultimately became the second piece in the deal that sent top prospect Addison Russell to Chicago. But the 32-year-old faded in Oakland and now joins a loaded market for mid-level starters. Hammel’s reps at Octagon will go out looking for multiple years, but can he achieve it without taking a lower AAV? Though he went through a rough stretch after moving to Oakland, putting a hurt on his bottom-line results, Hammel actually finished quite strong. He allowed just 14 earned runs over his last 50 2/3 frames for the A’s, good for a sub-3.00 mark that was more reminiscent of his sturdy open to the year with the Cubs. On the whole, you can’t argue with 176 1/3 innings of 3.47 ERA pitching, and that’s what Hammel delivered in 2014. Neither is there reason to believe that those figures were the result of some dumb luck. Hammel did benefit from a .272 BABIP and 78.3% strand rate, but the 12.0% home run-per-flyball rate fell above his career average and could be due for a bit of regression. ERA estimators were generally supportive of the final earned-run tally, as Hammel posted a 3.92 FIP, 3.57 xFIP, and 3.50 SIERA. 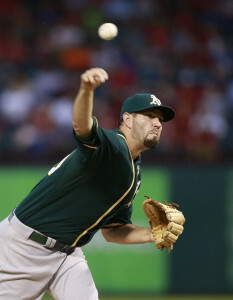 Best of all, Hammel showed a restored ability to generate strikeouts. Back in 2012, his breakout year with the Orioles, Hammel posted 8.6 K/9 against 3.2 BB/9. In 2014, after a drop in the intervening year, he landed at 8.1 strikeouts and 2.3 walks per nine. He also has maintained his fastball velocity in the 92-93 mph range, a tick off from ’12 but in line with his career standards. And he increased the usage of his slider, with positive results. Hammel also managed reasonable effectiveness against batters from both sides of the plate, yielding a .305 wOBA to lefties and a .297 mark to righties. In spite of his overall success last year, Hammel is not without his areas of concern. For one thing, the stellar groundball rate he reached in 2012 (53.2%) has dropped over a dozen percentage points in each of the last two years. That could be due in part to the fact that he has gone to the four-seamer more frequently, with his two-seam offering dropping in effectiveness. Likewise, Hammel has seen an advanced proclivity to allow the long ball. His home run-per nine figures have both returned to the levels they sat when Hammel was struggling to establish himself at Coors Field. And pitching in Wrigley Field does not offer an excuse; the park actually landed in the middle of the pack in terms of permitting the long ball, and Hammel did not exhibit strong home/road splits in this department. Then there is the question of durability — or, perhaps more to the point, innings. Hammel did miss significant time over 2012-13 with knee and elbow issues. He came back to deliver an injury-free 2014, of course, but those recent, reasonably significant issues cannot be discounted entirely. On the whole, while his medical sheet does not look overly concerning, Hammel has yet to finish a season with more than 177 2/3 frames to his record. He nearly matched that mark this year, logging 176 1/3 innings, and probably would have bettered it had the A’s not skipped his turn down the stretch. But the fact remains that Hammel has not established himself as a 200-inning workhorse, even when he has been healthy — a fact which delivers its own concerns. Hammel is married with one child. He writes on his personal blog that he loves spending extra time in the offseason with his wife, Elissa, and young son. LEGO construction, in particular, seem to be a preferred family pastime. Per a somewhat outdated profile, Hammel resides in Rehoboth, Massachusetts, close to his wife’s hometown. Hammel himself was born in South Carolina and graduated from high school in Washington. He also attended Treasure Valley Community College in Oregon, from where he was plucked in the tenth round of the 2002 draft. This is where things start to get tough for Hammel. On the one hand, in terms of recent results and career workload, Hammel looks like a better bet than Scott Feldman, who landed three years and $30MM on last year’s market. And he is a good deal younger (or less risky) than the roughly comparable arms that landed two-year deals last year: Bartolo Colon (2/$20MM), Scott Kazmir (2/$22MM), Tim Hudson (2/$23MM), and Bronson Arroyo (2/$23.5MM). But this is a different market, one that includes a good number of arms that offer more extended track records or higher upside. I’ll crib from Tim Dierkes’s profile of Santana. As Tim noted there, the second tier of starters (behind the big three) includes not only Santana but names like Kenta Maeda, Brandon McCarthy, Francisco Liriano, Justin Masterson, Jake Peavy, and Hiroki Kuroda (assuming the latter decides to pitch). Other than Kuroda, the only players even eligible to receive qualifying offers are Santana and Liriano, meaning that Hammel will not stand out in that regard. In some respects, Hammel’s trajectory over the last three years looks something like that of Santana entering last year’s market: first a strong year that made him look like a long-term piece, then a dud that led to a change of scenery, chased with an ultimately fulfilled chance to re-claim value. But 2013 Santana was arguably the second-best arm available in a thin market. For Hammel, there’s a case to be made that he lands outside the top ten. Though the competition is fierce, the volume of good arms loose on the market also indicates that multiple clubs will be looking to fill in the gaps that were left. But last year, in a free-spending environment that blew out previous cash outlays and awarded significantly more deals of three-or-more years in duration, only eight pitchers got more than two years guaranteed, with six others getting a second year (and that’s if you include Tim Lincecum, who was extended just before officially reaching free agency). Ultimately, I think there is a decent chance that Hammel ends up being one of the hurlers who falls through the cracks somewhat and does not maximize his value in a competitive market. While a two-year deal at a strong AAV cannot be discounted as a realistic outcome, I’ll predict that Hammel gets a third year but has to sacrifice some annual salary to do so, landing at the Feldman deal with a three-year, $30MM contract. Hammel’s going to be a big bargain for someone. Solid middle of the rotation pitcher who is always healthy. That’s a huge plus. Always is a bit of a stretch. He had injury issues in both of his years in Baltimore. Always healthy? Hammel missed time in 2013 and 2014 and didn’t always tell the team he was hurting until it got so bad he needed to stop throwing the ball. You have no way of knowing if Hammel will be a true bargain or not. Three years $30MM seems a bit high for Hammel who is already 32 years old. I see him getting closer to a Phil Hughes type deal 3 years / $8MM per. Agreed. I think the 3/30 numbers are a bit inflated. I wouldn’t be surprised if we saw a reunion with the Cubs. I think they’re aiming higher. I never understand these sorts of comments. Of course they’re aiming higher in the grand scheme of things. Of course they’re bigger priority is to sign a top of the rotation guy. You do need a 5 man rotation, though. Hammel would fit in perfectly in the 4-5 slot. For what it’s worth, the Cubs finished with the 6th best FIP in baseball (3.51), not too far behind the Indians’ 3.42 (good for #2 in baseball). I’d say that speak favorably to the depth of the staff. Finding a usable piece for 4 or 5 in the rotation for less than $10 million a year should be pretty easy and not that big of a priority. Somebody at the top is the priority; throwing cash at Hammel to fill a role they don’t need filled will hinder them in achieving the priority signing. There has been a lot of speculation that the Cubs are after two starters this winter, so Hammel as a second would make decent sense. Obviously Lester is the #1 target, and a previous story suggested that Shields would be the fallback on the top-end. Just my own belief, but if the second starter isn’t a TOR guy (to not count on Arrieta to be more than the #3 in theory), I don’t think they’re going to be dropping $10 million a year on the second guy to round out the back of the rotation for three years. That just seems cost prohibitive for a marginal improvement (if any) on the pile of guys they can throw at it already. I’d be more of the mind that if they’re getting any veteran for the back end that it’d be more like a guy with warts on a one year make-good deal where he’s got an opportunity to bounce back and get paid (like Feldman, Hammel did). I’ve never really understood why Hammel always seems to be such the hot trade/free agent commodity. He’s had one and a half good years and has been pretty below average-to-bad the rest of his career. If someone told you 3/$30MM was a possibility for anybody else with his career line, you’d think they were insane. In the grand scheme of things, He would be a solid number 4/5 for about 20 teams in the Majors. With that being said, with names like McCarthy, Volquez, Maeda, Kuroda, Peavy, Santana, Liriano, Masterson, Harang etc. I only take Hammel over Peavy and Harang on this particular list. IF my Sox can pick out an arm from the upper middle tier (Santana, Mccarthy, Liriano, and Maeda for upside sake) on a reasonable contract and trade for an ace, I think it fits in with their new philosophy with large contracts, and makes us competitive in 2015 while keeping payroll open for 3B. I would consider Kuroda more of a 2 or 3, maybe even an ace by some measure more then a back-end starter but I think Kuroda either signs with the Yankees, retires or goes back to pitch in Japan. The only team besides the Yankees he might sign for is the Dodgers IMO unless someone outbid both of them which I can’t see happening. .
He’s easily better than Volquez and Masterson (unless the latter finds his FB again). Wouldn’t at all mind a return to Colorado. There’s always the problem that if Hammel can get similar money to pitch in a friendlier park…well, you know.